Medical Center South Campus (formerly South Fulton Medical Center) now stands. 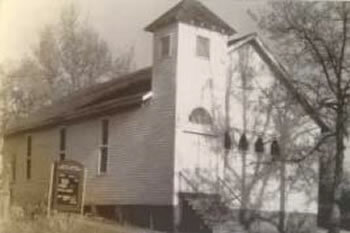 Union Baptist Church is considered to be East Point’s first African-American congregation, formed in 1866 shortly after the end of the Civil War. The congregation originally met in an area east of the railroad tracks and north of Wadley Avenue. In 1884, the congregation purchased property on East Cleveland Avenue for $100 from Miss E. A. Mangum. This area became known as Blakesville (later known as the Graball community), possibly named for the congregation’s pastor, Rev. James Blake, who executed the East Cleveland property deed. It’s unknown what year the first building was built on this property, but most likely it was built by 1891 when East Point established a free school system. Before a public school was built on Randall Avenue in 1916, African-American children in East Point attended schools in several churches, including Union Baptist Church. It is believed the building in the photo below was built around 1917-18. As historian Anne Larcom described it, the church building was “a beautiful white plank rural Gothic church with a bell tower entry and a bank of decorative arched windows across the front.” Further quoting Ms. Larcom, “This building was probably constructed in 1917- 18, accompanied by a re-organization of the church. The young minister who came to serve this ‘new’ or renewed church and congregation later acquired national recognition, love and respect as the pastor of Ebenezer Baptist Church and as the father of Martin Luther King, Jr., foremost among civil rights leaders. Daddy King, as he was affectionately known in later years, accepted a call to this church in 1918….” Only 18-years-old when he accepted the call to Union Baptist, Rev. M. L. King, Sr., served the East Point congregation until 1931, when he left to begin his long tenure at Ebenezer Baptist in Atlanta. In 1958, the Tri-City Hospital Authority began acquiring property along East Cleveland in order to build South Fulton Hospital (now Atlanta Medical Center South Campus). At that time, the congregation of Union Baptist Church agreed to sell and re-locate to 1185 East Washington Avenue. 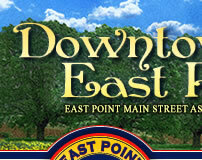 “We Have Come This Far by Faith: A View of Six Historic Churches in East Point, Georgia” by Anne S. Larcom for Dr. John M. Matthews, History 864-B, Georgia State University, March 17, 1988, pp. 3-6. Black America Series: East Point, Georgia, by Herman “Skip” Mason, Jr., Arcadia Publishing, 2001, pp. 53 & 109.